Diesel cars kill tens of thousands due to pollution – but what about driving petrol cars. That is worse because they cause greater CO2 emissions, which will kill many more through climate change. Our Lord says : ‘And why beholdest thou the mote that is in thy brother’s eye, but considerest not the beam that is in thine own eye? I’m OK trashing the climate but you have children and that’s much worse. In the MSM reports allowed conclusions like these: Avoiding having children allows you to screw the climate. –1– This is evident in the ‘flying teacher’ example above. Any reduction of world population is as good as any other. –2– None of the reports in the appendix cite the original work by Murtaugh & Schlax, which estimates carbon emissions for different countries. Although this work is flawed, it does note that the impact of children is very, very much higher in richer countries than in poorer ones. –3– The carbon cost of children is independent of parenting. The assumption in the reports is that parents have little influence over the carbon emissions of their children. However, if you have a child now but don’t have a car, don’t fly and don’t each much meat (especially beef and lamb) then the carbon cost of your child will be much lower than average – at least until they are in their teenage years. There are samples of the way the MSM reported this issue in the Appendix. Skip to there to avoid the rather laborious detail of the argument. Before analysing the detail a prelude is necessary. Humanity can emit about 100 tonnes CO2-equivalent (CO2e) per person before we have a climate disaster. This will cause the deaths of billions of people and the extinction of many other species. This number of 100 tonnes is an Individual Remaining Carbon Budget found by dividing the total Remaining Carbon Budget (770 billion tonnes of CO2-equivalent) by the number of people in the world (7.6 billion). Is that extra child costing the earth? The word is going round that having that extra child leads to enormous increases in your carbon footprint. With some other clues, I estimate the teacher in the example above has a lifestyle that causes the emission of at least 50 tonnes of CO2e per year, five long-haul flights is a substantial part. 50 tonnes of CO2e is more than three times the CO2 emissions of an average US citizen. This means that the carbon footprint of one extra child is worse than driving an average car a distance of 1000 kilometers every day of the year. All your life. As the number of descendants increase the carbon emissions add up to a very large amount – even though for each descendant the share of their emissions is diminishing. Wynes & Nicholas considered carbon emissions in ‘developed’ nations (average lifetime 80 years), it is possible to see that their estimate of the carbon cost of having an extra child is about 4,668 tonnes CO2e – over 46 times the individual budget (100 tonnes CO2e) for avoiding “dangerous climate change”. Option 1: Greenhouse gas emissions are be reduced to zero or below, as outlined by several IPCC reports, so that future generations can avoid dangeroous climate change. Option 2: Greenhouse gas emissions continue to be high bringing on a sixth mass extinction where future generations – and most life on Earth – die. The first case, possibly optimistic, reduces greenhouse gas emissions enough to save the climate. Let us consider a specific case, where emissions are reduced from the present level of 6.2 tonnes CO2e per person to zero in equal yearly steps. The question arises: How soon must we reach zero emissions to stay within the 100 tonne CO2e limit? In other words, a steady reduction to zero emissions will just exhaust the Individual Remaining Carbon Budget over a period of 33 years – sooner if cuts in emissions are too slow. In short: Climate disaster in 33 years (probably less). If the “flying teacher” were to keep with this individual budget, she would have just 3 years to reduce from 50 tonnes CO2e to zero. As this is extremely unlikely we must count on other people having much lower emissions. Fortunately the poor of the world emit much lower amounts as this infographic from Oxfam shows. It is probable that, in the real world, neither Option 1 or Option 2 above will happen. It will be somewhere in between with many climate related deaths among the poor. We should note that killing off the poor will of limited help in saving the climate. 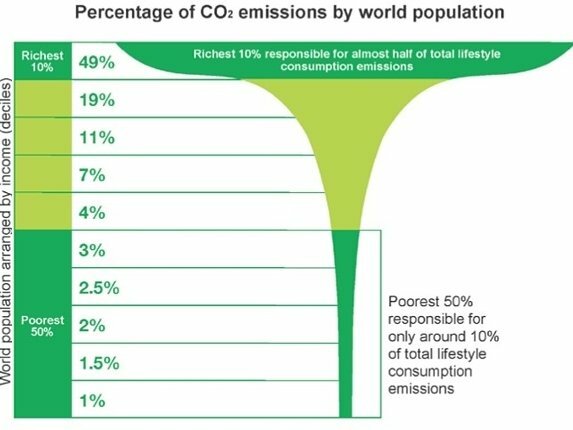 Kill the poorest half of the world and emissions are only reduced by 10%. What is the carbon cost of an extra child? –3– World carbon emissions will reduce to zero over the next 33 years. –4– Fertility of 2 children per couple. –5– Children are born when you are 25. –1– Today: Have 2 children. 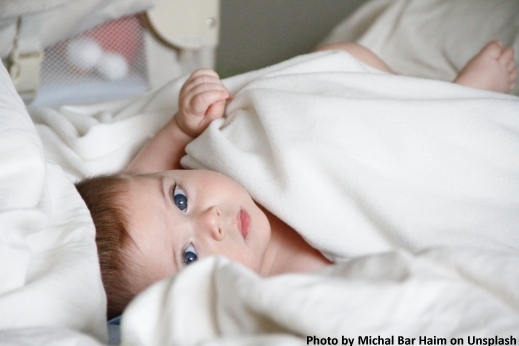 Count one child to you – the second to your partner. –2– 25 years time: Your children have 4 offspring. Count one grand-child out of four. In this crude model of reproduction, the extra emissions in 33 years time for the descendants assigned to one parent is 106.8 tonnes of CO2e. Over the 33 years that is 3.23 tonnes CO2e per year. If the parents have just one child, the emissions of the descendants that is assigned to one parent is 53.4 tonnes CO2e. So avoiding one child cuts your carbon emissions by 53.4 tonnes CO2e. That’s rather less than the estimate of 4,668 tonnes CO2e from Wynes & Nicholas. For frequent reminders on the problems of over population, I do follow the Twitter feeds of @PopnMatters, @RichardLAshwell and @soupypeas. Having children in a ‘developed’ country causes many tonnes of CO2e. Nowhere near the 4,668 tonnes CO2e that Wynes & Nicholas calculate – but it will be more than enough to severely damage the climate. Don’t trash the climate because your neighbour has a child. Having multiple children was found to have the largest impact on climate, with each child creating nearly 60 tonnes of CO2 each year. Avoiding a one-way transatlantic flight could save around 1.6 tonnes of carbon dioxide emissions, while a round-trip to Australia would prevent 4 tonnes – 20 times the saving made by a year’s recycling, which is around 200 kg a year. Mail Online: Want to save the planet? Don’t have children! Recycling, washing clothes at 30°C and switching to energy saving bulbs are all touted as ways to help the environment. But if you really want to save the planet, one of the best ways is to not have children, according to a study. Foregoing one round-trip transatlantic flight each year would cut a person’s emissions of CO2 by 1600 kilograms. Getting rid of their car would reduce emissions by 2400 kilograms, or 2.4 metric tons. And by choosing to have one fewer child in their family, a person would trim their carbon footprint by a whopping 58.6 metric tons. “We found there are four actions that could result in substantial decreases in an individual’s carbon footprint: eating a plant-based diet, avoiding air travel, living car free and having smaller families,” said lead author Seth Wynes of Lund University in Sweden. Germany, Deutsche Welle: Having fewer children: A solution for climate change? The data lie when they’re made to. Or at least they can be made deceptive. There are 2 problems with this model. 1. Attributing a child’s emissions to the parents is suspect at best. They are separate people, and while parents are responsible legally for their children, and children’s emissions might be partly made to seem like their parents’, exactly how much it should be is impossible to parse objectively or even with any reasonable judgment. 2. The whole calculation should be scrapped because the frame of personal responsibility for climate catastrophe is unworkable, counterproductive, and should therefore be discouraged. Even if everyone who cared reduced their emissions by 90% it would make almost no difference. (The methods needed are a mystery, as reducing that much in the context of a high-emissions society is nearly impossible except through poverty.) Those who don’t care, who already emit the most, would go right on doing that, in fact would likely increase. And what’s under our personal control is only a very small part of our per capita emissions. The US military is the largest single-entity emitter in the world. How do US citizens reduce “their share” of that? Not by voting, which has turned out to be a virtually useless expression for the vast majority. Not by what Joe Romm calls ripoffsets; it’s too late to buy indulgences and think it’s doing anything except relieving the guilt of the guilty. In fact, real solutions to this crisis can only be implemented by political change, as a whole society. It will be good to have a smaller population (reaching it gradually enough not to be disruptive) but by far more important is reducing total impact by replacing fossil fuels with 100% efficiency, wiser lives, and clean safe renewable energy, reforesting the world and transforming chemical industrial agriculture to small-scale low meat organic permaculture.